Disclaimer: There are many companies out there making terrain for modelmakers and wargamers. Those I have listed are only some of those available and relate to my own personal experience. The best thing to do is to shop around! For those of us lucky enough to have the space at home to have our own table suitable for gaming, whether that involves a permanent fixture or something that can be put up and taken down before your partner goes really mad, there is an embarrassment of riches out there to fill the table up with. Resin terrain both painted and unpainted, sculpted battleboards, townscapes, mountains, dense woods and cultivated farmland. There is one great limiting factor though (isn't there always?) and that is of course price. For those of you who grew up in scouts and watching Blue Peter it might be possible to make it all from scratch. Sculpting magnificent terrain from dense insulation foam, filler and household objects is well within the capabilities of some hobbyists. If that is you then I am in awe of your work but that is not always within the grasp of us mere mortals, who have to look at commercially available options if we want to avoid going back to the days of stacked books under a tablecloth. First of all, and I am assuming you have a suitable space available- either a large table with a board atop it or, as I do, two 6' x 2' pasting tables I got from a well known DIY emporium. The next thing to consider is what to put on top. There are some lovely scultped terrain tiles available. 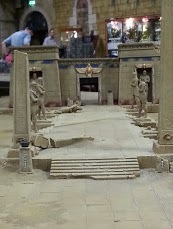 Games Workshop make the Realm of Battle board for example. These are not cheap, and good as they look are rather full of skulls if you intend to use it for anything other than sci-fi or fantasy games. Other companies, such as Ziterdes make similar products (at a similar price.) Recent kickstarter projects by Games & Gears and Secret Weapon Miniatures promise great looking products at a slightly cheaper price, but even so this is the premium option with a premium pricetag. The next rung down, and a more affordable alternative, is a battlemat. American companies Hotz and Zuzzy make flocked mats and vinyl/rubber moulded mats that can give a very impressive appearance to any table once used with other terrain. Mat o War make products similar to the old citadel battlemat- a sort of green baize effect that again, when suitably dressed up, can look very effective and can be rolled or folded up between battles. Of course when I was a kid I had painted hardboard and it didn't do me any harm! With a bit of effort and some textured paint this is a decent option, and again works well with the modular terrain that is readily available nowadays. Once you have the board you need to put stuff on it. Hills are a common feature of many battlefields and there are many affordable plastic and resin options to choose from, Citadel do some decent options for example. Model trees are again easy to get hold of and generally need very little work beyond basing, Gale Force 9 do a decent example. Fences and walls again are suitable for lots of historical periods and fantasy gaming, Rendera plastics make a good range of different types at a very reasonable price as well as ESLO scenery, Escenorama and Hovels UK. For buildings to populate your battlefield the modern wargamer is really spoilt. No more making rudimentary hovels out of lollipop sticks! The modular plastic kits and plastic snap together sets have been around for a few years now, and Games Workshop, Pegasus Hobbies, Rendera and Perry plastics have some great sets that look fabulous when painted up, using the same techniques as you would use on any large plastic tank. New products, such as the modular terrain being produced to accompany DeadZone (which should be available in 2014) and the current Kickstarter by Maki games, are expanding these options all the time, boosted by the technological advanced of 3D modelling. 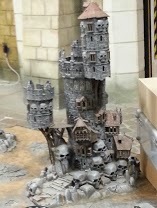 If that is too much modelling for you then whole resin buildings, such as those available from Hovels UK, GrandManner or Forgeworld, can be really stunning centrepieces when painted and based to match your battlefield (which requires a bit more effort than a plastic set but is well worth it.) Be warned though, prices vary significantly and it can be an expensive option, albeit one worth investigating. A newcomer to the market is the laser cut MDF option. Companies like Sarissa Precision and 4Ground are producing excellent flat pack sets for a wide range of settings and periods (generally at 28mm and 15mm scale.) These are the Scandinavian furniture of tabletop terrain and are actually much easier to assemble that they appear at first. I think I am right in saying that Gothic Sci-Fi of the 40k mould has not been covered by any of the ranges to date, but this is surely a matter of time and will give gamers an option to include NON ruined sci fi terrain to their battlefields. 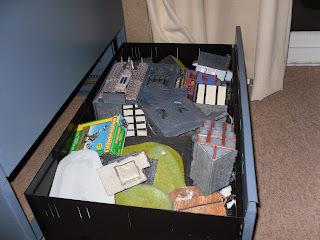 Scratch building scenery is a hobby in itself, and can be rich and rewarding. Once proficient you can make some wonderful and unique stuff. If you are unable to do this, whether because of time constraints or simple ability (yours truly- you can see some of my efforts in that drawer!) then there are so many options nowadays to produce the sort of battelfields you could only dream of 20 or so years ago. You have a beautifully painted army, do not make them fight over piled up books anymore.